The Beatles Song of the Day is Carry That Weight. Carry That Weight. Carry That Weight was written by Paul McCartney and is part of the medley of songs on side 2 of Abbey Road. Paul wrote Golden Slumbers and Carry That Weight together as one piece and it was recorded that way. The song as part of the medley is near the end and it brings back the theme of the first song in the medley- You Never Give Me Your Money- money, fame business and the pressures of fame. All four Beatles sing that Carry That Weight chorus. 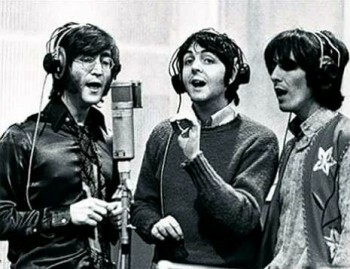 Paul McCartney: double-tracked vocal, chorus vocal, piano, rhythm guitar: George Harrison: chorus vocal, bass, lead guitar: John Lennon: chorus vocal: Ringo Starr: chorus vocal, drums: Produced by George Martin. rating Carry That Weight- ***** out of 5 stars: a classic. Carry That Weight was never released as a single. Recorded on -July 2,3,4,30,31 and August 15, 1969. Spignesi and Lewis rank it along with the rest of the medley of songs at #36, Rolling Stone #23, Critic Bill Wyman #22-29, The Beatles Listeners Poll #4, and Jim Beviglia #2.